In the wake of the third and final Presidential debate, I can almost audibly hear a collective sigh of resignation from the recesses of America. This is it. There’s no back-door, no last-ditch candidate swooping in to save the day. These are our choices. And when it’s over, we’ll be faced with another choice; whether or not to respect the Office of President. Just under 3 weeks from now, our nation will have a new President with the last name of either Trump or Clinton. And the vast majority of Americans will be unhappy with the results. So what do we do on November 9th? How do we move forward when we don’t agree with, support and in many ways respect the winner? Because I don’t support either candidate, I don’t have to wait until next month to decide. I’m trying to figure it out now. I have children who are asking questions and talking about government in school. It’s going to be a long 4-8 years and not that much longer before they will be voting. My actions now will determine in part, the attitude they have about government as they grow up. 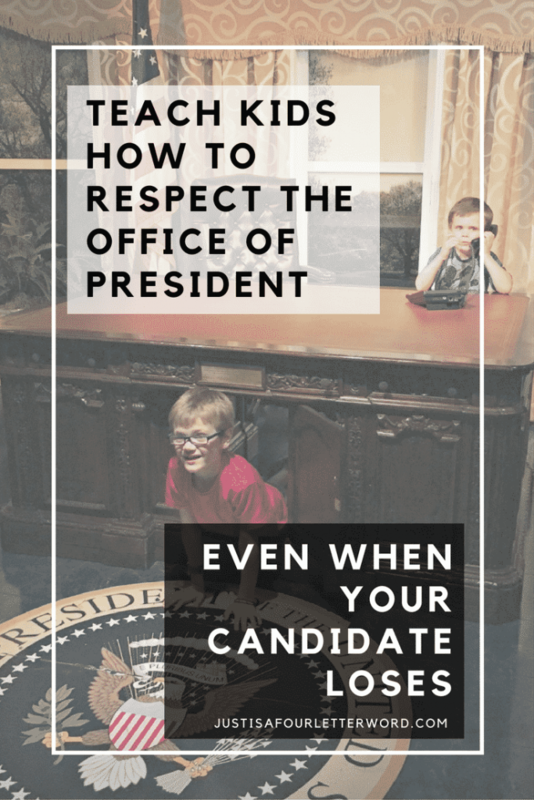 I have always been taught to respect the Office of President regardless of my opinion of them as a person. This is something I think our culture is quickly forgetting and I won’t allow it to die with me. As a conservative woman who did not vote for President Obama, did not vote for Trump in the primaries and who will not vote for him in November, I’m used to being on the losing side of an election. I’ve been doing it for eight years. In other words, its like deja vu all over again. That said, there are certainly ways to channel my disagreement into something productive or at the very least, something that isn’t destructive. It’s easy to get blown apart by the statements made on both sides of this election, but the wonderful thing about freedom and humanity is that we each have the power to control our reactions to life. So here are some common sense ways to keep it together for the next four years. We all (ALL) have personal issues with either one or both candidates. We don’t like the way they operate, the way they talk, the things they say. We don’t trust them. Yes, character is important, and you’ll use character as a litmus test when deciding who to vote for. Beyond that, keep the insults to yourself. Once we have a President, it’s a done deal and we will need to focus on how to make it work. Insults only bring the whole system down, and to be completely frank, they are how we ended up with these candidates in the first place. No singular phrase or song lyric has run through my mind more than these words made famous in Lin Manuel Miranda’s Hamilton. Aaron Burr gets such a bad rap doesn’t he? Smarmy, smooth talking politician that he was, who wouldn’t take a stand. And I’m not trying to debate his value here. But a little talk less, smile more would go a long way in this election. It will go even farther when it’s over. Because at the end of the day, we still have to work, live and breath among friends and family with whom we disagree. We won’t all vote the same but when we wake up on the 9th, we will all still be Americans and in 4 years, we’re going to do this all over again. “Talk less” is not meant to stifle freedom of speech, it’s to encourage wisdom of speech. It’s simply a call to pause and reflect for a moment when choosing your words. It’s a call to productive speech that can heal instead of words that compete for the best insult. “Smile more” is finding common ground. I’m pretty sure most of us are on to the media and campaign games that bring extremely polarizing hot-button issues to the forefront of every conversation. These tactics are meant to incite fear and urgency so people will get up and vote. But there are many more issues to face. And on these issues, some progress could be made if anyone would take 5 minutes to find some common ground. I’ve been watching a lot of CNN because it’s the only news channel we get with our basic Sling subscription. I recently had to stop because the incessant and constant yelling is completely out of control from the guests to the hosts. It’s non-stop baiting and taking the bait over and over and over. The internet is a lot like this. Some funny zinger you agree with is just too good to not share. You know it’s over the top and a caricature but the insult is so good, you post it. Then the friends (or strangers depending on where you post) come out of the woodwork on the attack. Or maybe you see something so wrong that you just have to comment and the cycle continues. My advice, respectfully, is to stop offering the bait and to stop taking it. Be secure in your beliefs and skip the clearly non-productive posts that aren’t really hoping to have meaningful conversation. You know what they are. When we leave that stuff out of the equation, anger is minimized and at times we can actually see through to the other side. This is how change happens. Don’t take the bait. The Office of President is obviously very famous, but no man or woman, no matter how many votes they get, will be calling the shots without checks and balances. That’s why our government is so important. It’s hard not to get caught up in all the sensationalism of this election, but let’s remember that there are many other offices holding elections. Learn about your local races, do your homework and make informed decisions all the way down ballot. Then, after the election is over, pay attention to what is getting done (or not) and write to your representatives, send letters to the editor. Stay informed and active in a productive way (see: don’t take the bait) and build something. This will model to your kids that life goes on when your candidate loses. It really does. As much as I love this country and our democracy, I have a deeper understanding that there are no guarantees in life. I can’t control the outcome of the election any more than I can make it snow on Christmas day. I will do my part by voting, and I hope you will too. But beyond that, we wait. And we react. Our reactions may prove to be the most important outcome this year. No matter how horrified we are to have Donald Trump and Hillary Clinton as our nominees, our culture created them. They are here because we, as Americans, put them here. As my boys ask questions and hear political conversations, I don’t want them to take away messages of anger and fear. I want them to know how privileged we all are to even have a choice and to know that beyond any government, they are loved and valued and capable of sharing that love and value with others, even and especially those who don’t share their opinions. This is how to respect the Office of the President beyond election day. By reminding yourself and the ones you love that no one person is the end of the story. No one person will be the savior of America. And our own actions and reactions can build up or destroy. Four years ago, we were in the exact same position and I wrote a post called, “What If Romney Wins” with the idea of helping people move forward after such an emotional election. I think the aftermath is going to be so much worse that four or eight years ago. I was thinking of writing a similar post and I’m happy that now I don’t have to. Thank you! I have a feeling reality is going to be a tough pill to swallow for many people when all is said and done. Sigh. Thank you for this! This is so helpful to parents who have been in a funk since the election and upset kids wanting to create change because of the outcome. Thanks for reading! I agree. We don’t always get what we want and that’s a lesson better learned sooner than later!